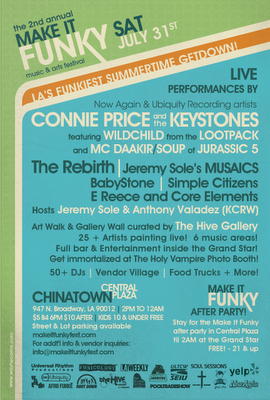 It’s curious that presenter Flock Shop changed the name of its evocatively titled Funk Rumble Block Party to “Make It Funky” Music and Arts Festival for the sophomore outing (Perhaps potential ‘burb patrons were nervous about a potential Sharks and Jets-type throwdown?) but the line-up at this year’s event is no less rumble-in-the-concrete-jungle funk fabulous. Anchoring the half-block-party/half-festival at the Chinatown Central Plaza is Connie Price and the Keystones, the soul project of former Breakestra boy and guitarist, producer, multi-intstrumentalist Dan “Connie Price” Ubick. Featuring Wildchild of the LootPack, MC Daakir/Soup of Jurassic 5 and Percee P, the band has been hip hop legend Big Daddy Kane’s primary back up band these past few years. Also from Breakestra, Carlos “Loslito” brings further funk with Rebirth while Jeremy Sole both co-hosts the fest (with fellow KCRW DJ Anthony Valadez) and brings it with his own project Musaics. Backed by a nine-piece band, BabyStone‘s Novena Carmel (Sly Stone’s grown-up little girl) gives Next Gen groove with co-writer, guitarist, producer Itari Shapira; the aurel funk feast continues with Simple Citizens, E Reece & Core Elements, and 50+ underground club DJs spinning throughout the afternoon/evening in six event areas. In other words, you’ll want to consume the get-your-groove-on equivalent of Wheaties before venturing downtown, Go Go’ers. As part of the something-for-everyone spirit of the fest, kids are welcome at the fenced-in festival (although furry friends are verboten) while (ir)responsible adults can drink like Diddy at the Grand Star Jazz Club, then stay for the free, 21+, drink-until-2AM after-party . An infinitely preferable ending to the neighborhood block parties where the Crazy Cat Lady comes out and sprays everyone with the hose….